CALBAYOG CITY, Samar – A marathon inquest proceeding was conducted by the City Prosecutor’s Office in the afternoon of February 22, 2009 after the arrest of 21 individuals for violating R.A. 8294 in relation to COMELEC Resolution No. 8714 or Rules and Regulations on the bearing, carrying or transporting of firearms or other deadly weapons and employment, availment or engagement of the services of security personnel personnel or bodyguards during election period for the May 10, 2010 local and national elections. Among the 21 suspects, two are under the custody of City Social Welfare and Development Office, while 19 have been subjected to inquisition under Chief Prosecutor Feliciano Aguilar and Prosecutors Virgilio Cabral and Ferdinand Arpon respectively, and Michael Terga who had an outstanding warrant of arrest for murder, died in an encounter against the joint elements of the Regional Public Safety Management Battalion (RPSMB), Regional Intelligence Division (RID) and Special Task Group - Private Armed Group (STAG PAG). It is note taking that the following persons namely Liberato D. Logero, Wendel G. Terga, Lolito O. Jalayajay, Jesus A. Jalayajay, Antonio B. Ayawan (residents of Brgy. San Jose, Calbayog City); Herminigildo S. Estoconing, Wilfredo D. Velasco, Geronimo M. Velasco, Marwin O. Velasco, Francisco J. Velasco (Brgy. Sinantan), Romulo B. Paghunasan (Brgy. Navarro), Jimmmuel T. de Pablo, Elbito P. Fermino, Felipe A. Eyano, Merlito A. Eyano, Restituto T. Sabilao (Brgy. Patong), Jimmy J. Dealagdon, Elmer L. Dealagdon (Brgy. Hibatang) and Leo Y. Macabidang (Brgy. Rawis) were arrested on February 21, around 3:45 in the morning. The joint elements has confiscated 41 assorted firearms from said operation such as rifle single shotguns with magazines, calibres 5.56, 22, 45, and 357, airgun, M16 rifle, Ingram and KG9 sub- machine guns and different ammunitions. In an interview, PInsp. Alden E. Dugan revealed that the simultaneous operation conducted by the joint elements was based on the virtue of the warrants of arrest issued by Hon. Judge Manuel F. Torrevillas of RTC Branch 32 and Hon. Judge Reynaldo B. Clemens of RTC Branch 31 against Michael Terga for a crime of murder and Lolito Jalayajay for violation of Section 78 (now Sec. 77) of R. A. 7161, respectively. He added that based on the intelligence report, suspects were frequenting in Brgy. Patong and staying in any of the houses of said place. Jimmy J. Dealagdon on the other hand denied allegation of his involvement in the private armed group based in Brgy. Hibatang and attesting himself as a member of the lupon. While the inquest proceeding was being conducted, Chief Prosecutor Feliciano Aguilar said that the two minors under the custody of CSWDO will be exempt from the inquisition and the same office will determine should there be discernment on their commission of the crime. PANACAN, Davao City – Local terrorists blasted an Improvised Explosive Device (IED) in the village of Sangay in Malita town in Davao del Sur province 1:35 PM Saturday. The bomb blast narrowly missed a passing military convoy going to the village of Pangleon also in Malita town. Reports show that soldiers were on their way for a community outreach and “pulong-pulong” (village meeting) when the explosion occurred. Local Terrorist Front-71 (LTF-71) of the New People’s Army (NPA) is believed to be behind the newest IED explosion in Davao del Sur. Last year four policemen and a civilian were killed when NPA terrorists exploded a roadside bomb in this province. The 10th Infantry Division (10ID) under Maj. Gen Carlos Holganza strongly condemned the recent attack. “These local terrorist clearly do not respect Human Rights. The use of IED is outlawed by every civilized nation in the world. It clearly shows the terrorist nature of the CPP-NPA-NDF.” Holganza said. A record number of IEDs were blasted by local terrorists in region 11 in the past. A total of 11 IEDs exploded in the region in 2009, eight of these explosions resulted in the killing of 11 (10 of which were government troops and one civilian) and wounding of 30 individuals (28 government agents and two civilians). Six of these explosions were in the hinterland parts of Davao City, three in Davao Oriental, one each in Davao del Norte, Davao del Sur and Compostela Valley Provinces. 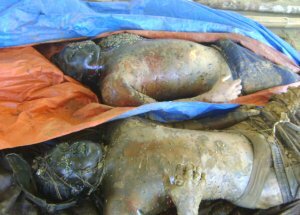 Several unexploded IEDs were also recovered by government troops in different parts of region 11 in 2009. No less than Leoncio Pitao, the notorious terrorist leader in Davao region admitted the use of IED as one of their tactic in fighting the government in stating before the media about their emplacements of IEDs fashioned out as “landmines” along road nets to be exploded anytime. Post blast investigation is currently being conducted by a team from the Explosive and Ordnance Division together with the Davao del Sur Police. MANILA – Makabayan senatorial bet and Nationalista Party guest candidate Satur Ocampo today proposed a two-step solution to the current power mess – fire Energy Sec. Angelo Reyes and repeal the law deregulating the power sector. "As a first step, the President should fire Sec. Angelo Reyes for his incompetence and his failure to uphold the interests of consumers against the big power and oil firms," Ocampo said. "We don't need an energy secretary that doubles as a spokesperson for big oil and power monopolies. We need a new secretary who upholds the people's interests," he said, adding: "From day one Reyes did not nothing but ensure that the oil cartel and the power monopolies continued to rake in super profits at the expense of the consumers and the public good. Reyes should have been sacked long ago." Ocampo also said that experts need not look far for solutions to the problems besetting the electricity sector. He called for the repeal of the Electric Power Industry Reform Act (EPIRA) as a necessary step. "EPIRA institutionalized the onerous IPP (independent power producer) contracts of the Ramos administration and delivered the energy sector on a silver platter to private monopolies. EPIRA enables the government to wash its hands of the responsibility of providing the public with affordable and efficient electricity service," he stressed. Said Ocampo: "Government should not abdicate its strategic role in ensuring cheap and abundant power. Napocor should be cleansed of corrupt officials and made to be the country's leading power producer. In this way we can achieve scale and ensure transparency and accountability in the energy sector." Ocampo said that before EPIRA, the generation and distribution of electricity were a government service – "There was still the potential for the industry to be an instrument in increasing national productivity and building economic progress. It was after EPIRA that that electricity rates in the Philippines became the highest in Asia." “Proponents of deregulation and privatization promised the public that these were the solution to lower power rates. The exact opposite has happened." Finally, Ocampo said that electricity should be restored as a public utility as opposed to a privatized business venture. "There's a whole set of steps that need to be taken – re-nationalize all distribution companies and IPPs; appoint officials to the regulatory agencies with the mandate to align rates with the regional average. Privatization for profit should not be allowed when it comes to utility firms such as oil, water and electricity," he said. TACLOBAN CITY – The Increased Crop Output thru Rural Infrastructure and Community Empowerment (ICOT-RICE) Project of the provincial government of Leyte will be intensified among the pilot areas identified as well as more polish in its implementation this year. According to the Office of the Provincial Agriculturist it is necessary to polish certain rules and correct minor flaws in the implementation process of the ICOT-RICE program before bringing it to other areas of the province. This as other municipalities in the province have been clamoring for the project to be implemented in their farmlands. Hilongos in the fifth district and Tabango in the third district have been keen in introducing the program with their local rice farmers. With Leyte basically an agricultural province, the ICOT-RICE aims to promote and expand the cultivation of hybrid rice as an approach to increase rice productivity and profitability by establishing rice techno demonstration projects in rice producing municipalities in the Leyte. Under Leyte Governor Carlos Jericho Petilla, various efforts and interventions have been introduced in order to develop this very sector, on top of the programs and projects undertaken by the national government. Two years ago, the provincial government set on stream the ICOT-RICE project by providing production loans and marketing assistance to rice farmers, initially in Sta. Fe, Leyte. The farmer beneficiaries were from Brgy. Pilit, Sta. Fe, Leyte and the program covers more or less 58 hectares of ricelands. The venture reportedly proved to be a big help to these farmers who were once the favorite preys of loan sharks in the area. Starting with over 200 farmers in six barangays, there are now over 400 rice farmers covering eleven barangays who are enjoying the benefits of the ICOT-RICE project. The production loan amounting to P15,000 per hectare, covers the expenses for labor, seeds, fertilizers, insurance and pesticides. As for the marketing support aspect, the Provincial Government of Leyte buys the palay produced by its recipients adding one peso every kilo to the prevailing price in the locality. Farmers all over the province are seen to become recipients of the ICOT-RICE Project. Presently, the Office of the Provincial Agriculturist supplies quality rice to the different department of the provincial government as well as its facilities and even extends to private individuals and groups at competitive cost. TACLOBAN CITY – Leyte province’s comprehensive sports and education program to be dubbed as Sports Academy, for potential athletes will be underway in March with recruitment and identification of possible sports scholars already spread all over the province. The province’s core team for the sports program recently met with barangay captains from Leyte’s third district to coordinate the recruitment process as well as with the rest of the barangay chairmen in the province for the same purpose. 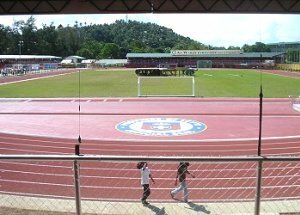 According to 3rd District Board Rowil Batan recruitment has been intensified with target date for start of the free sports training already slated this March 16. “We have been all over the barangays in the whole province and coordinating with the chairmen on possible recruits who could avail of this program all for free,” Board Member Batan said. It was learned there are 60 available slots for the said scholarships where the potential athletes can get free training in various sports disciplines such as track and field, swimming, boxing and taekwondo, free board and lodging and free education. The Sports Academy is prioritizing recruits who are out of school youths and cannot afford to get themselves to schools. As a requirement the potential sports scholar must be between eight to fourteen years old and stands 5’6’ in height. The pool of athletes who would be recruited under this program would be housed in one place where they would attend sports trainings under professional trainers and coaches and at the same time complete their school studies supervised by the Department of Education. A trainer from the United States is set to arrive mid March to jumpstart a sports clinic. The vacated rooms and spaces at the former Leyte Colleges adjacent to the Leyte Sports Development Center have been converted into a dormitory for these athlete-scholars. Leyte Governor Carlos Jericho Petilla said to improve the province’s, and subsequently the region’s, standing in national sports competition, there is a need to implement a good recruitment program that would provide championship caliber training for athletes with potentials. “This would be very expensive but if it’s the only way to do it, then we have to pursue this option,” Gov. Petilla said. With an improved pool of athletes, the governor added, the province and the region can improve it medal finish in national sports competition such as the Palarong Pambansa. TACLOBAN CITY – The Department of Environment and Natural Resources (DENR) in region 8 has distributed 21,488 Free Patents to beneficiaries of the Handog Titulo Program at the close of 2009. The land titles distributed covers an aggregate of 18,566.153 hectares in the six (6) Eastern Visayas provinces. Regional Technical Director Ramon Unay of the Land Management Service revealed that around 58% were generated through the Comprehensive Agrarian Reform Program (CARP) while the Land Administration and Management Project produced around 40% of the total number of Free Patents distributed. RTD Unay further disclosed that the implementation of LAMP Phase 2 in the region has resulted in the issuance of 8,760 land titles with an aggregate of 6,847.16 hectares in the different Leyte towns were the Project is being implemented. Another 188 Free Patents were issued under the regular and downloaded funds of the Department to its field offices in the region. Free Patents issued by the DENR through the Handog Titulo Program serves as absolute proof of ownership for it beneficiaries. The land titles are given to actual occupants of alienable and disposable lands after completing certain documentary requirements. Regional Executive Director Primitivo Galinato, Jr. encourages the recipients of the Free Patents to make their lands productive. The distribution of lands through the Handog Titulo Program is one of government’s strategies to address poverty in the uplands as it implements its Anti Hunger Mitigation Program through the administration of President Gloria Macapagal-Arroyo. BASEY, Samar – Poor and indigent residents who availed the rice distribution sponsored by Governor Milagrosa T. Tan apparently got discontented when despite of their long hours of waiting, they were only given half kilo of rice, a quantity they said inadequate for a family of six members in one meal. A 70 years old widow, Mana Trofina, rose early from her bed last February 8 as leaders of Tan publicly announced that Tan will arrived in their barangay for a rice distribution activity. The coming of Tan, who is famous in distributing cash, rice, caps, umbrellas and appliances in every time she visit a place, gave so much excitement to Mana Trofina, among with her neighbors numbering around 100 who spent at least 6 to 8 hours of waiting at the barangay multi-purpose hall in Can-manila, Basey, Samar. Fishermen and laborers from Sitio Bangon, Paraiso, Tabuk and proper, who regularly go out of home to look for income, had to cancel their daily chores hoping to get “something” from Tan more than they usually earn. At around 12 noon, an official of the barangay had to buy canned goods and biscuits to feed the waiting residents, mostly women accompanied by their minor children. Until around 3 p.m., the Tan’s camp finally arrived bringing with them sacks of rice ready for distribution, the people still at the midst of their excitement, started murmuring when their names were called and was given one to two cans of rice or half kilo, the most, contained in a plastic bag. Governor Tan was a no show in the activity but she was represented by her daughter Angel Tan, who likewise handed over a cash of one thousand pesos (P1,000) for the 11 barangay officials, equivalent to P90.90 each before she left for another barangay. Mana Trofina, in her way home, expressed her frustration and dissatisfaction over the circumstances saying, “naubos ko lugod ak oras paghinulat hin asya la ine, kun ginpakabuhi ko nala lugod bangin naka sobra kilo pa ako.” A pedicab driver named Owen, with three family members depending to him measured the rice given to him also said, “it was exactly one and a half (1 ½) can of sardines.” Others who appeared to be coming from a “relief operation,” lined-up in their way home, were also publicly expressed their dissatisfaction. However, not all of the recipients were disappointed. Other recipients, especially those “one day-one eat” folks have expressed gratitude to the governor for the rice they gave to them. “Maupay nala ine kontra hit waray,” they said. Meanwhile, sources said that what transpired in Can-manila has also occurred in other barangays in Basey. They said the “rice distribution” activities with the same situation also transpired in their towns. In another development, critics of the Tans alleged that the instant rice distribution in some towns is just a “diversionary” tactics to cover the raging controversy at the capitol. While the Tans were distributing some goods in some towns, capitol employees and other workers from provincial offices including the district hospitals in Samar gathered themselves in front of the capitol on February 8, and staged their long-planned protest rally for the failure of Gov. Tan to release the P25,000 year-end bonuses that were due the provincial government employees in year 2009. Protesters, to include members of the Confederation for the Unity, Recognition and Advancement of Government Employees (COURAGE), employees of Basey and Gandara District Hospitals also appealed to the concern authorities to investigate the questionable transactions of the governor. This paper, among with other media outfits, tried to reach Tan at the Capitol but her office was empty of staff last February 8, 2010. Efforts to get the comments of Tans went futile. CALBAYOG CITY, Samar – Breastfeeding advocates have found a new and formidable partner in its advocacy – Eastern Visayas RDC. Today, the Eastern Visayas Regional Development Council (RDC) proposed for the Establishment of Breastfeeding Rooms/Corners in Government offices. In the latest RDC meeting held today at the Calbayog Sports Center, sponsored by Mayor Mel Senen Sarmiento, Regional Director Forter Puguon of the Department of Labor and Employment (DOLE) presented the reasons why such move is pushed. The move, said Puguon’s presentation is consistent with the United Nations Millennium Development Goal (MDG) number one which is eradicating extreme poverty and hunger. The DOLE Director also said that doing the act of establishment of breastfeeding rooms/corners in government offices will create an atmosphere of harmonizing with the right of the child and the UN MDG. “It is also anchored in the global strategy on Infant and young Child Feeding (IYF-DOH)” stressed the presenter. Aside from the given reasons, breastfeeding is also consistent with the much publicized Nutritional Guidelines for Filipinos and the Updated Medium Term Philippine Plan of Action for Nutrition (MTPPAN) for 2008-2010, he added. Because mothers refuse to breastfeed, 30% of under-five children are underweight, according to the data presented. The data stressed that only 16.1% of Filipinos are exclusively breastfed. As the RDC meeting folded up, RDC members could not decide yet whether to support the move or not, one member asked whether this does not violate a Civil Service rule, they still have to ask. CAMP LUKBAN, Catbalogan City, Samar – Two (2) dead bodies were found by the barangay officials of Concepcion, Arteche, Eastern Samar buried in a shallow grave two days following an encounter that transpired between the terrorists and elements of Army’s 14th Infantry Battalion in the forested area of Brgy. Dorillo, Jipapad same province. The 2 cadavers were identified as Elcon Liad (True name: Lilio Liad) alias Binal/Mila/Nilpo/Batoy, 31years old residents of Brgy. Dorillo, Jipapad E.Samar, CO of Regional Security Force (RSF).and Navy/Antoi (True name unknown), Political Guide of 1st Squad, RSF Code name: Bangkaw EVRPC. Report disclosed that around 4:30 P.M. of February 14, while the platoon of Sgt Orosco was having their temporary patrol base in Brgy. Concepcion, some barangay officials and tanod personally led by their Chairwoman Zedaria Pajares brought out two cadavers. Accordingly, an undisclosed folk discovered the said grave due to its strong foul scent that prompted Pajares to lead his constituents to identify and later on bury the bodies more decently. Initial report revealed that the duo’s cause of death were gunshots base on the wounds that found all over their body. One body suffered a wound at his right armpit while the other one is at his neck that believed to be the cause of their instant death. It can be recalled that on the morning of February 12, troops under Staff Sergeant Pejana encountered some 10 terrorist NPAs at Brgy. Dorillo and reported that most of the rebels were wounded including the owners of their recovered M16 and M14 rifles. This situation is no longer new to the underground movement that once their comrades were wounded in action, they drag it away from the troops and avoid it being caught for they are afraid that information can be elicited from their wounded comrades. Lt. Col. Jaime Hidalgo, commander of 14IB already sent his troops to facilitate the burial and assist the doctors who examine the remains. Meanwhile, the Commander of 8th Infantry Division Maj. Gen. Arthur I Tabaquero expresses his heartfelt appreciation to the Brgy officials who initiated the simple good deeds of bringing out the truth to the open. “This simple deed is a clear manifestation of support to our advocacy of pursuing peace to achieve development in the whole region,” Said Tabaquero. “I urge you to carry on your simple ways of supporting our government to encourage your fellow local officials to replicate same for us to ultimately attain our dreamt peace and development in this part of the country,” He added. This successful feat against the terrorist NPA is the third time for this year following an encounter in Brgy. Rizal, Eastern Samar in January 13 and in Brgy Santander, Bobon, Northern in January 29 where two (2) M16 rifles, radios, war materiel, personal belongings and voluminous subversive documents with significant values were collectively recovered. Moreover, MajGen. Tabaquero calls upon the peace-loving Samarnon that should an incident occur that wounded NPAs were left in their possession by the fleeing terrorists, they should inform any nearest PNP or Army detachment to help them attend their medical needs. “The 8ID will always be here to give these NPAs, wounded or not a chance to live freely and re-experience the fruit of democracy whenever they feel the desire to. We will give necessary medical attention the same treatment we give when we have our wounded soldiers for it is the right of the individual.” The good general concluded. Authorities confirmed that the duo were got killed during the earlier encounter with the elements of 14IB. Elcon Liad was further identified as the CO of Regional Security Force (RSF), EVRPC with code name: BANGKAW. Their remains were provided of decent burial at Public Cemetery of Brgy Conception, Arteche, Eastern Samar. BASEY, Samar – To ensure the continuing development of free, orderly, honest, peaceful and credible electoral processes, the Regional Office of Commission on Elections (COMELEC-8) has simultaneously conducted a Voters Education Program and Public Demonstration of the Precinct Count Optical Scan (PCOS) in almost all municipalities and cities in Eastern Visayas. This is in part of the Commission’s six-year modernization program (from 1992-1998) consisting of eight key components namely flexible legal framework, systematization of present method of registration, modernization of electoral, continuing election education campaign, management information, upgrading of facilities and equipment, decentralization and development of Comelec personnel. In Basey Samar, the Voter’s Education Campaign and demonstrations of PCOS machine was held on February 15, 2010. Invited participants were the executive and legislative officials, barangay officials, employees, local candidates and the general public from the municipalities of Sta. Rita, Basey and Marabut, all of Samar. 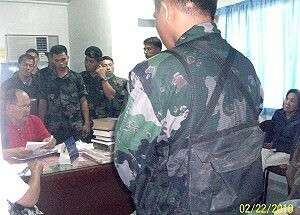 The PCOS demo was initiated by Comelec Acting Regional Election Officer Atty. Jose Nick A. Mendros and his counterpart from Samar Atty. Ma. Corazon Motallana, Provincial Election Supervisor II, Virginia V. Besas, Basey Election Officer III and Gray O. Bateo, Marabut Election Officer II. During the demonstrations, it was learned that PCOS, or optical mark reader (OMR) or simply known as “ballot counting machine” wherein a voter is given a ballot, with pre-printed candidates’ names, with corresponding ovals to shade or broken arrows to connect. The voters in the shaded ballots would be scanned using this kind of machine. Accordingly, this system is already familiar to all students taking the National Secondary Aptitude Test (NSAT), formerly NCEE (National College Entrance Examination), given by the Department of Education (DepEd), and to other people taking the Civil Service Commission (CSC) Licensure Examinations and other examinations given by the Professional Regulatory Commission (PRC), wherein the answer sheet is composed of ovals and the chosen answer would be shaded by the examinee. A similar system is employed by the Philippine Charity Sweepstakes Office (PCSO) for its Lotto system, wherein ovals corresponding to the numbers being bet upon are also shaded. In all these, the answer sheets and the lotto cards are read, or counted, by OMR machines. Since the system makes use of ballots, and also considering the fact that it is already familiar to the public, this system was recommended as the most for the Philippine setting. “With the use of centralized counting centers, a ballot counter could be assigned to count the ballots from several precincts or even from a whole municipality depending on the number of registered voters,” Atty. Mendros said. In open public demonstrations, the public is very much worried on their lack of knowledge of computerized voting, jammers, counting of ballots, unusual ballot rejection, machine error, mistake in shading ballots among other minor problems. But the COMELEC personnel have assured the public of its safety by answering all the issues and worries raised by the public. Volunteers coming from the listening public were called up stage to have a personal test and operation of the machine. Pre-testing of ballot insertion to the machine and other procedure were also demonstrated to the public. Atty. Mendros called on teachers, barangay officials, and ordinary citizens to test the machine themselves. The COMELEC top brass also assured the public that no one or even the BEIs can change or alter the number of votes the machine counted. He further explained that even the jammers cannot affect the voting process, “it will only delay the transmittal of the election results, and it is a very minor problem and the Commission can handle it,” he said. It also explained that the major changes of this automated system from the old manual system of voting, counting and canvassing of votes are the following: no writing of names, ballots are not anymore counted in the polling places, added security features in the printing and shipment of ballots, human intervention is limited to telling the machine to start and stop the counting the ballots, has data storage device because the appreciation of ballots is entirely done by the machine. Meanwhile, the COMELEC, however, failed to explain in their demonstrations the exact number of clustered precincts per municipality but assured there were surely one machine in every barangay in the coming May 2010 elections in the Philippines. In Eastern Visayas, as of March 17, 2009 data, the Commission has recorded six (6) provinces, seven (7) cities, 136 municipalities, 16,408 polling precincts and 2,337,185 registered voters in Eastern Visayas region. CAMP SUMOROY, Catarman, Northern Samar – Seventy two (72) newly completed Kalayan sa Barangay Program (KBP) projects were turned-over to the different barangay officials of Lope de Vega, Bobon, Catarman, Northern Samar last February 6 and 7, 2010. These KBP projects that were constructed in the barangays previously affected by insurgency in Northern Samar were made possible through the collective effort of the residents of the barangays, the local government units and the military led by the 803rd Brigade, Philippine Army under the able leadership of Col. Arnolfo Atendido through the Special Operation Teams (SOT) of the brigade from calendar year 2004 to 2008. This is in line with the national government’s outreach program dubbed as “People Government Mobile Action (PGMA) Serbisyo Muna” caravan. Said projects were funded by the AFP/DND and constructions were undertaken by the Philippine Army engineers under LtCol. Rizalito Tibon of 543rd Engineering Battalion. Among the projects constructed were the following: two (2) farm to market roads; twelve (12) health centers; eight (8) two classroom school buildings; twelve (12) sets of street lights and four (4) level of ii water systems. The turn-over was supervised by the office of the Presidential Assistant for Eastern Visayas represented by Mr. Alberto Ellema and witnessed by Colonel Atendido represented by Major Melecio Y. Castillo, civil military operations officer of 803rd Brigade, PA, Colonel Arnaldo Fernandez Jr, commander 53rd Engineering Brigade, PA, Lieutenant Colonel Rizalito Tibon, battalion commander of 543rd Engineering Construction Battalion, PA and provincial and local government officials of Northern Samar. Completed KBP projects were received by the respective barangay captains of the municipalities of Lope de Vega, Catarman, and Bobon all of Northern Samar. Twenty six (26) barangay captains who were recipient of the KBP projects expressed their deepest gratitude to the officers and men of the Philippine Army for the immediate implementation and completion of the projects. To sum-up the effort of the 534 Engineering Battalion, a total of 72 KBP projects were completed and turned-over to barangay officials of Northern Samar by 803rd Infantry Brigade, Phiilippine Army breaken down into 24 school buildings, 19 health centers, 13 sets street lightings, 6 barangays electrifications, 8 water systems and 2 farm to market roads. On the message of Colonel Atendido delivered by Major Castillo encourages the residents to take good care of the facilities and reminded them that said project was a component of the peace and development program in the barangays. In his parting words, Major Castillo reminded the barangay officials not to allow terrorists to enter their barangays nor provide support to ensure that peace and properity reign in their respective barangays.